Reach out to teachers, students, writers and more when you advertise with this Journal, Power Bank and Pen Gift Set! It includes a satin pen, UL listed 200 mAh on-the-go portable charger and a Shelby notebook. Customize the set to reflect your branding information with a one-color, one-location imprint on each item and a four color process imprint on the gift box. 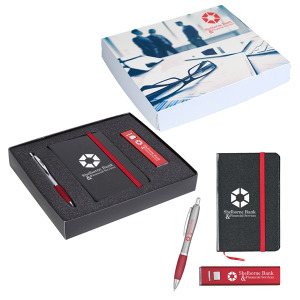 Hand it out at schools, seminars, business meetings and more to spread the word about your brand with a useful marketing tool! Various colors available for each item. Please specify color selections on PO. Satin Silver Barrel Pen with Blue, Purple, Green, Charcoal, Orange, Red, Pink, Lime Green, Yellow or Burgundy Rubberized Grip. Translucent: Blue, Red, Charcoal, Green, Purple, Orange, Yellow, Lime Green, Pink or Burgundy, all with Matching Rubberized Grip and Silver Trim. Portable charger: Blue, Purple, Silver, Black, Red, Gold or Green. Notebook: Black with Black, Light Blue, Blue, Lime Green or Red Trim. I'm interested in learning about the Journal, Power Bank And Pen Gift Set. Please contact me.